Decorate with memories. Collect and share. Gifts that matters more. Life is best when lived. Second best when remembered. We believe it should be easy to turn your digital memories into high quality, physical prints. We deliver everything from Framed Big Prints, Posters, Calendars and Classic Prints to Photo Strips and Magnets. Regardless if you want to decorate your home, gift away treasures moments, collect or simply archive your photos in Memory Boxes - those are the things we do best. And it's simple. Download the app and get started. Printing has never been this effortless. The best photo printing service in Scandinavia. Bring your photos into life. From your iPhone to your home in just a few clicks, delivered in just a few days. Get started by downloading the Framkalla App now. All our products are printed and produced in Sweden. And that's something we're very proud of. When we produce locally it's easier for us to ensure the highest quality, good conditions and fast delivery. All those things we find important. We've also personally handpicked the paper and printing method to ensure life long quality on all our printed products. Our posters are printed on Hahnemühle Pearl 300g paper, the poster calendar is printed on Hahnemühle Studio 210g writable paper. Our other prints are printed on Fujifilm Supreme HD Lustre matte photo paper. All our products can be found in our iPhone App, available on Appstore. Tell a story, create something visual or simply collect your best memories all in one poster. The perfect gift to yourself or a loved one. Add a frame and it will be ready to hang immediately. The classic of all classics. Use your prints for interior, turn them into gifts or fill up a photo album with precious memories. Choose between 3 different sizes: 10x10cm, 10x13cm and 10x15cm. Add a Memory Box and it's a perfect gift already when delivered. Treat your loved ones with a Gift Card and let them turn their favourite memories into whatever they feel like. It does not get more personal than that in terms of gifting. The retro version of the print and the old time classic. Choose between 20, 40 or 80. Always delivered in a beautiful Memory Box with a to/from card and an archive card for free. Turn it into a gift or put in somewhere nice to decorate your home. A lovely classic to decorate your fridge, a lamp or simply anything with a little magnetic attraction. Your magnets will be delivered as a batch of nine measuring 5x5cm each. Say hello to our refined series of Framed Prints allowing you to order your own photo art from your personal photos. It's a concept inviting us all to create great interior from our greatest life stories. Or to gift away something that really matter to both you and the happy receiver. Create your wall art from your own favorite photos. Tell a story about your kids, your wedding or your favorite vacation. Or create something arty from your best conceptual shots if that’s what you’re into. The Anything is possible being the strongest feature of our Framed Print series. If you invest in creating your wall of memories, we do want it to last a lifetime. 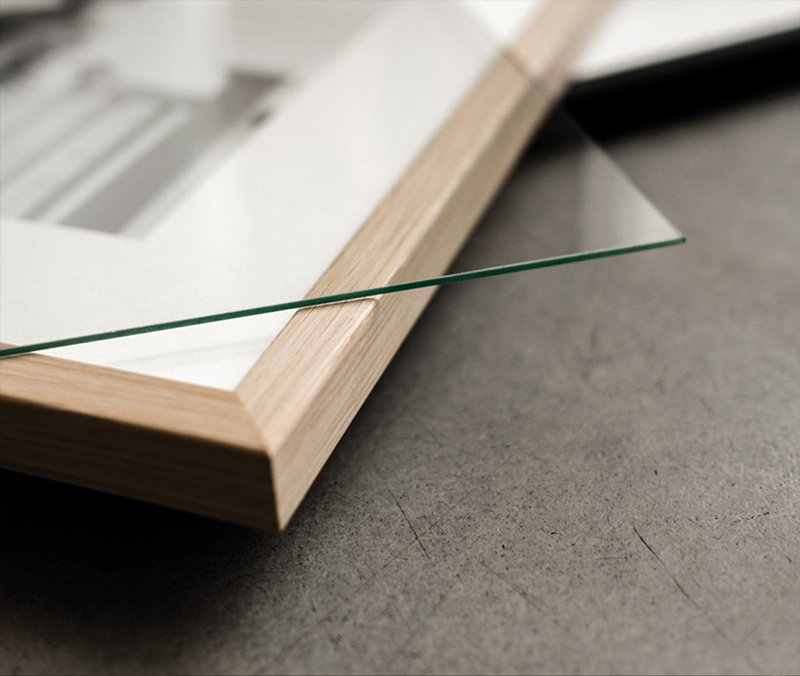 The printing quality is the finest on the market, our frames are all made from high quality Swedish wood and we put real glass into them instead of the acrylic version. All our frames are made in Sweden from high quality wood and can be delivered in white, black or oak. Not the passepartout kinda person? Or do you prefer to mix it up a little? Choose our full bleed option for a full size print. We take great pride in our craftsmanship, taping all our back sides with acid free tape, just like the museums. Why? Simply because we want your prints to last a lifetime. All our frames are nicely encapsulated in real glass instead of acrylic glass. Paper quality: Hahnemühle 310 gram Pearl - Semimatte photo paper. Framing technique: Acid-free 400 grams paper on the inside of the backside taped with acid-free tape on the backside to last a lifetime. Float glass as a standard. Frame material and colour options: Swedish high quality wood frames in white, black and oak. Frame sizes: 30x30, 30x40, 40x40, 40x50, 50x50. All sizes measures 20mm in depth and 15mm width. Framing options: Acid free black/white passepartout or full bleed. Find inspiration from our lovely community. All creations representing different life stories and different styles, but all produced with the same genuine quality and technique. Find your favourite wall and start imagine how to tell your visual story. Then let it grow into something beautiful, unique, personal and stylish. Life is best when lived. Second best when remembered. Therefor we believe it should be easy to turn your photographed memories into high quality, physical prints. 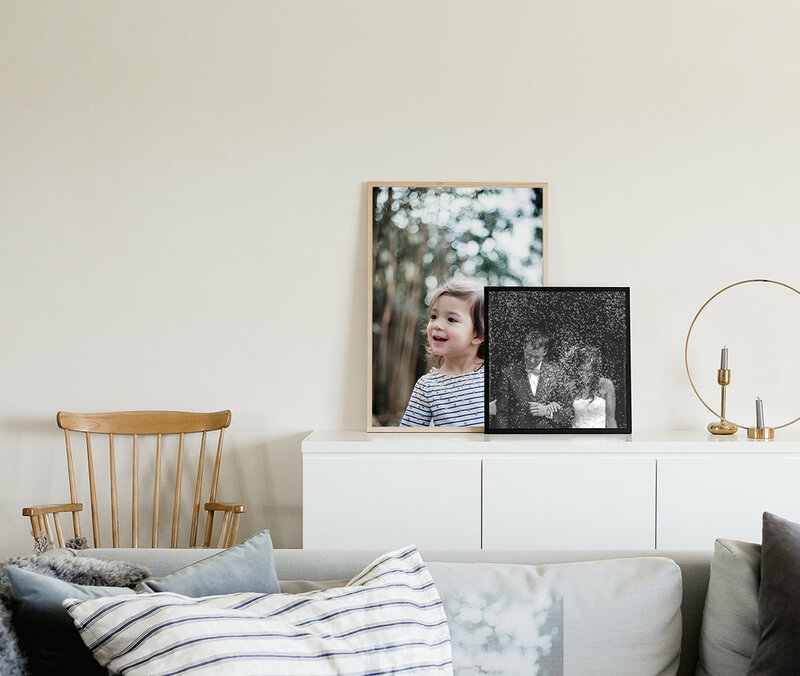 Regardless if you want to decorate your home, gift away treasures moments, collect or simply archive your photos in Memory Boxes - those are the things we do best. And it's simple. Download the app and get started. Printing has never been this effortless. All our products are produced in Sweden and we're proud to say that we've personally handpicked the paper and printing method to ensure lifelong quality on all our printed products. When we produce locally it's easier for us to ensure the highest quality, good conditions and fast delivery. All those things we find important. Are you a story teller? Collaborate with us! Our photo products do not reach full potential until they’re filled with great life stories, moments and memories. We therefore always look for people to make our products the best they can be by adding personality, style and that final touch. Everyone has a story to tell and what better way to tell it than through prints? Therefore, anyone can become our influencer. We do not look for a specific type or a specific kind of home. We look for diversity and life stories, all unique in their own way. Do you feel like telling yours while helping our products to reach a new level with your creativity? Do not hesitate to contact us for collaboration. When doing so, please provide us with all things worth knowing. Like statistics of followers, readers, impressions and general engagement from your social channels like Instagram and blog platforms. And of course, links to your platforms so that we easily can tell if we'll make a good match. Are you an interesting company looking for synergy? We all know that one plus one equals two. Are you a company selling interesting products that would benefit from our printed goods and vice versa? Do you think we can find a way to lift each other as well as creating added value to our customers? Then we're really interested in starting conversation with you. Are you a photographer looking for a printing partner? Are you one of those amazing people helping others to immortalise their memories of special days while telling their stories visually? Maybe you're a wedding photographer, a family photographer or portrait photographer? Or maybe you capture life and nature in all its glory? Or you prefer the more conceptual and arty kind of photography and want to sell your work of art to your audience? However you shoot - if you like to turn your work into print, we'd like to become your printing partner. The deal is simple: you order with your special code, pay nothing up front, then you resell for whatever price you like and we invoice you once a month. Have a look in our Printing Partner PDF for more details. We’re really looking forward to start Framing Life with you. Instagram @framkalla - Check out what our 55k + community is doing. Use #framkalla // #framinglife to inspire and to get inspired. Framkalla is run by Framkalla Europe AB, identification number 556943-4227. These terms and conditions are established between Framkalla and its clients. Swedish law is applied on all terms between Framkalla and the customer. As soon as Framkalla receives your order and order payment a confirmation email is sent to you. It is therefore very important that you enter a correct email address. Please save the confirmation email so that you can retrieve your order ID in case you have any questions to customer service. Our customer service is open 9am to 5pm on weekdays, we always try our very best to answer within 1 day (weekends and holidays not included). Payment is handled by Klarna or Stripe. You have the possibility to pay with your credit card (Visa, Mastercard/Eurocard), online bank or invoice. All prices are including VAT 25%. Sensitive information such as your credit card details are always transmitted to Klarna or Stripe encrypted (SSL) to ensure that no one else can access the information. No sensitive information is stored by Framkalla, it is sent directly to Stripe or Klarna. Invoice payment requires the customer’s personal identity number (invoice payment is only possible in Sweden). We send your orders with Postnord. We deliver within 5-7 business days. If you have not received your delivery after 10 business days contact customer service at hello@framkalla.com. Please include your order number in the email. Make sure you type the correct delivery address when placing an order, Framkalla is not responsible for lost packages due to incorrect address or if the customer’s name is not visible on the door/mailbox. Larger orders will be delivered to your nearest post office. When your order has been picked up for delivery you will receive an email with tracking ID allowing you to track your order (only available to track package in Sweden). You will receive a text message when your order is ready for pick-up at your local post office, you will also receive an email reminder followed by a reminder sent to your home address. It is therefore very important that you confirm your details before placing your order. Don’t forget to bring your ID when collecting your package. Your package is available for pick-up at the post office for 14 days, it is then sent back to Framkalla. If you have not retrieved your package during these 14 days and wish to have it sent again we will send it for an extra fee. Please contact us to obtain an accurate cost to send to you. This fee will be sent as a separate invoice to the customer. If you wish to cancel your order you need to place an email to customer service at hello@framkalla.com before 6am the morning after the day of ordering. But please note that your order is customized and can't be cancelled once it has been completed. We will always do our best to cancel in time but if we can’t there is no possibility for a refund. It is not possible to alter your order after payment. Since our products are unique and customised, thanks to your own pictures, there is no cancellation or alteration policy, in accordance with the Distance Purchase Law. If there is something wrong with your order upon delivery please contact our customer service at hello@framkalla.com. Describe what is wrong with your order and help us out by attaching some photos explaing the issue. If we conclude that there is an error in production of your order or if your order has been damaged under transportation we will gladly compensate you with a new order. Any faults or damages on your order must be communicated to customer service within 14 days after delivery. We reserve the right for any errors including pricing, technical issues or incorrect information presented by Framkalla services. Each time you use our services you agree to abide to the current terms and conditions. Framkalla reserves the right to at any time to change these terms and conditions. We always strive to make our customers as saticfied as possible and therefor we really do appreciate that you contact us if you have any concerns. We're here for you at hello@framkalla.com and will always do our best to help you.